Electrolytes are compounds that can conduct electricity once they are dissolved in a solvent. Electrolytes are basically the ions that are present in a solution after the compound dissolves in the solvent. Those ions will conduct electricity, so we're going to say whenever we add a solute into a solvent, three outcomes are possible. The solute can completely dissolve and if it completely dissolves, then it's called a strong electrolyte. It breaks up into its ionic forms. The solute could partially dissolve and if it partially dissolves, that means some of it is going to maintain its molecular structure. Those are considered weak electrolytes. Then finally, the solute will not dissolve at all. When it doesn't dissolve at all, it's known as a non-electrolyte. Those are the three categories for electrolytes. Whenever you add a solute to a solvent there are three possible outcomes: the solute dissolves completely, dissolves partially or doesn't dissolve at all into ions. If we take a look here, we can actually classify different types of compounds as either being strong electrolytes, weak electrolytes or non-electrolytes. Let's look at the strong electrolytes. Our strong electrolytes belong into three categories. First things first, we have our strong acids. Strong acids are considered strong electrolytes. So they break up completely when they're dissolved in water. Examples here, we have HCl, we have a blank and then we have HI. Now if you take a look at your periodic table, you'll notice that chlorine and iodine are both in the same group number. Both of them are in Group 7A. Take a look at your periodic table, what element is in between chlorine and iodine? It will be Br, so HBr is considered a strong acid as well. HF is not considered a strong acid. It's actually considered a weak acid. It's because it possess hydrogen bonding. You'll learn about that later on. But just realize because of the hydrogen bonding it has present in it, HF is a considered a weak acid. So HCl, HBr, HI so far, HNO3 is another strong acid, then the last three will be H2SO4, HClO4, and HClO3. Those are considered your seven major types of strong acids. Now the second type of strong electrolyte we can have our strong bases. Now, we're going to say strong bases fit into two major types of categories up to this point. Later on, when we learn more in depth analysis on acids and bases, we're going to open up two more and more different types of acids and bases. For this point right now, this is all you really need to know when it comes to electrolytes. For strong bases, Group 1A metals when they're combined with OH-, H-, O2- or NH2-, they will be strong bases and they'll be considered strong electrolytes. Remember what's the charge of Group 1A ions? They're all +1. So we combine each of these with one of these ions. Na+ OH-, their charges just cancel out and you get NaOH. Here the charges just cancel out, you get CsH. The two from here is going to move down here. The one from here is going to move over here, so this would be K2O. Then, finally, you'd have LiNH2. So all of these are good examples of strong bases. Now, any one of these four ions could combine with any one of the Group 1A metals to create a strong base. Now, the next one we have Group 2A metals. Here we're going to say Ca or lower when they're combined with these same four ions creates strong bases. But what do I exactly mean by calcium or lower? Group 2A on our periodic table has beryllium, magnesium and then, calcium you have, strontium and barium. I'm saying calcium and lower, so calcium, strontium, and barium, when they're with one of these guys they create a strong base. All of them are in Group 2A, so they're all +2. If we combine some of them with some of these ions -- just remember the two from here will move down here, the two from here will move over here, the two from here will move over here. So, we get CaOH2, SrH2, Ba(NH2) 2. These are all common examples of strong bases from Group 2A. Finally, we're going to say soluble ionic compounds are considered strong electrolytes. What do I mean in this section? Here, this is basically ionic compounds that follow the solubility rules. For example, we're going to say that Na is a Group 1A metal. Group 1A ions are soluble with whoever they're with. So I could have Na with NO3. This will break up into Na+ plus NO3-, breaks up fully into its ions, so it's a strong electrolyte. We could also have LiCl. Group 1A metal, Cl is soluble with everyone also except for certain metals. So, our three categories for strong electrolytes are strong acids, strong bases and those that follow the rules for being soluble when we look at the solubility rules. Strong Electrolytes break up into ions completely and are grouped into 3 categories: Strong Acids, Strong Bases and Soluble Ionic Compounds. Our weak electrolytes fall into two categories: weak acids and weak bases. Here we have HF, which is hydrofluoric acid, then we could have acetic acid, then you could have a nitrous acid. Remember we've talked about naming acids already, so these names should not be new to you because we did go over certain examples when we've covered these very same weak acids and strong acids, weak bases, strong bases. Another example: carbonic acid and then phosphoric acid. Now, for the weak bases, remember we said for Group 2A metals, calcium and lower, when they're with OH-, H-, NH2- or O2-, they form strong bases. But these guys up here, when they're connected to OH-, they're going to form weak bases, so that's how we came up with Be(OH) 2 and Mg(OH) 2. We also have NH3, ammonia, and then we have NH4OH, this is ammonium hydroxide. That's considered a weak base also. Weak Electrolytes partially break up into ions and are grouped into 2 categories: Weak Acids and Weak Bases. Our non-electrolytes are just our molecular compounds, so our covalent compounds. They don't break up in solution. Remember covalent compounds are just non-metals with nonmetals. Here, two good examples are glucose and fructose. If they end with -ose, they're considered covalent sugars: glucose, fructose, galactose, maltose. For those of you who are biology majors, you should remember this, so if you end with -ose, you’re covalent sugar and therefore you're a non-electrolyte. We also have CH3OH, this is called methanol. If you end with the name -ol, -ol in the name, that means you're an alcohol. Alcohols are considered to be organic or molecular compounds. They're non-electrolytes too. So your teacher might say the name -ol at the end. Just remember that’s the same thing, same type of compound as methanol. Finally, another non-electrolyte would be water. Water doesn't break down into other fragments. It just stays water. It's the one that does the dissolving. It itself does not dissolve into smaller pieces. Non-Electrolytes do NOT break up into ions at all and are commonly referred to as molecular compounds. Example #1: Each of the following reactions depicts a solute dissolving in water. Classify each solute as a strong electrolyte, a weak electrolyte or a non-electrolyte. Based on different classifications of electrolytes we can expand to other compounds. Practice: Classify each of the following solutes as either a strong electrolyte, a weak electrolyte or a non-electrolyte. Choose the statement below that is TRUE. A. A molecular compound that does not ionize in solution is considered a strong electrolyte. B. A strong acid solution consists of only partially ionized acid molecules. C. A weak acid solution consists of mostly non-ionized (or non-dissociated) acid molecules. D. The term "weak electrolyte" means that the substance is inert. E. The term "strong electrolyte" means that the substance is extremely reactive. HCl, KOH,LiCl, and KI are ALL classified as A) nonelectrolytes. B) weak electrolytes. C) strong electrolytes. D) acids. Three different substances, A2X, A2Y, and A2Z, were dissolved in water with the following results. (Water molecules are omitted for clarity.) Which is the strongest electrolyte, and which is the weakest? Which of the following would best represent a strong acid, HX, in aqueous solution (water is omitted)? The dissolution of a compound is given by the reaction below: Identify each of the following solutions as either electrolytic, weakly electrolytic or non-electrolytic. Explain how a strong electrolyte, a weak electrolyte, and a nonelectrolyte differ. An aqueous solution of an unknown solute is tested with litmus paper and found to be acidic. The solution is weakly conducting compared with a solution of NaCl of the same concentration.Which of the following substances could the unknown be: KOH, NH3, HNO3, KClO2, H3PO3, CH3COCH3 (acetone)? Ritalin is the trade name of a drug, methylphenidate, used to treat attention-deficit/hyperactivity disorder in young adults. The chemical structure of methylphenidate is shown in the figure below. An electrolyte or a nonelectrolyte? Explain how a strong electrolyte, a weak electrolyte, and a non-electrolyte differ. 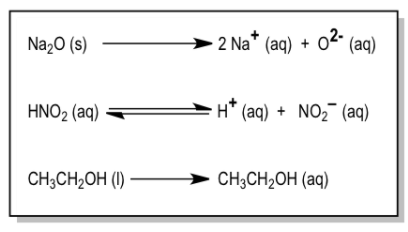 Aqueous solutions of three different substances, AX, AY, and AZ, are represented by the three diagrams below.Identify each substance as a strong electrolyte, weak electrolyte, or nonelectrolyte. A solution contains one or more of the following ions: Hg2 2 + , Ba2 + , and Fe2 + . When potassium chloride is added to the solution, a precipitate forms. The precipitate is filtered off and potassium sulfate is added to the remaining solution, producing no precipitate. When potassium carbonate is added to the remaining solution, a precipitate forms.Which ions were present in the original solution? What does it mean for a compound to be soluble? Insoluble? What are the cations and anions whose compounds are usually soluble? What are the exceptions? What are the anions whose compounds are mostly insoluble? What are the exceptions? Write the chemical formula for the cation present in the aqueous solution of AgNO3. Write the chemical formula for the anion present in the aqueous solution of AgNO3. Write the chemical formula for the cation present in the aqueous solution of Pb(C2H3O2)2. Write the chemical formula for the anion present in the aqueous solution of Pb(C2H3O2)2. Write the chemical formula for the cation present in the aqueous solution of KNO3. Write the chemical formula for the anion present in the aqueous solution of KNO3. Write the chemical formula for the cation present in the aqueous solution of (NH4)2S. Write the chemical formula for the anion present in the aqueous solution of (NH4)2S. Which of the schematic drawings best describes a solution of Li2SO4 in water (water molecules not shown for simplicity)? What dissolved species are present in a solution of KCN? What dissolved species are present in a solution of NaClO4? You may need to reference (Pages 158 - 162) section 4.5 while completing this problem.Write the ions present in a solution of K3PO4. Classify these compounds as soluble or insoluble. Drag the appropriate items to their repective bins. Which of the following statements is(are) true? For the false statements, correct them.a. A concentrated solution in water will always contain a strong or weak electrolyte. Which of the following statements is(are) true? For the false statements, correct them.b. A strong electrolyte will break up into ions when dissolved in water. Which of the following statements is(are) true? For the false statements, correct them.c. An acid is a strong electrolyte. Which of the following schematic drawings best describes a solution of Li2SO4 in water (water molecules not shown for simplicity)? Methanol, CH3OH, and hydrogen chloride, HCl, are both molecular substances, yet an aqueous solution of methanol does not conduct an electrical current, whereas a solution of HCl does conduct. Account for this difference. Which of the following statements is(are) true? For the false statements, correct them.d. All ionic compounds are strong electrolytes in water. A 0.1 M solution of acetic acid, CH3COOH, causes the lightbulb in the apparatus of Figure 4.2 to glow about as brightly as a 0.001 M solution of HBr. How do you account for this fact? You are presented with three white solids, A, B, and C, which are glucose (a sugar substance), NaOH, and AgBr. Solid A dissolves in water to form a conducting solution. B is not soluble in water. C dissolves in water to form a nonconducting solution. Identify A, B, and C.
Which of the following statements is (are) true? For the false statements, correct them.a. A concentrated solution in water will always contain a strong or weak electrolyte. Which of the following statements is (are) true? For the false statements, correct them.b. A strong electrolyte will break up into ions when dissolved in water. Which of the following statements is (are) true? For the false statements, correct them.c. An acid is a strong electrolyte. Which of the following statements is (are) true? For the false statements, correct them.d. All ionic compounds are strong electrolytes in water. When asked what causes electrolyte solutions to conduct electricity, a student responds that it is due to the movement of electrons through the solution. Is the student correct? If not, what is the correct response? Indicate the concentration of each ion or molecule present in the following solutions: (c) 0.0150 M C6H12O6Assume that the volumes are additive. Substance X is a molecular compound and is not an acid. Based just on this information, what can you determine about substance X? Check all that apply.a. X is soluble in water.b. X is insoluble in water.c. X is an electrolyte.d. X is not an electrolyte. What is the difference between (c) an acid and a base? Which of the following statements is TRUE?a. Ionic compounds at room temperature typically conduct electricity.b. An ionic bond is formed through the sharing of electrons.c. An ionic bond is generally formed between a metal and a nonmetal.d. Once dissolved in water, ionic compounds rarely conduct electricity.e. None of the above are true. HO, HBr, and HI are strong acids, yet HF is a weak acid. What does this mean in terms of the extent to which these substances are ionized in solution? An aqueous solution of an unknown solute is tested with litmus paper and found to be acidic. The solution is weakly conducting compared with a solution of NaCl of the same concentration. Which of the following substances could the unknown be: KOH, NH3, HNO3, KClO2, H3PO3, CH3COCH3 (acetone)? Classify each of the following substances as a nonelectrolyte, weak electrolyte, or strong electrolyte in water: (e) Cu(NO3)2. Classify each of the following aqueous solutions as a nonelectrolyte, weak electrolyte, or strong electrolyte: (f) C12H22O11 (sucrose). A solution containing an electrolytea. conducts electricity. b. does not conduct electricity. c. produces gas.d. is insoluble. Calcium chloride is a strong electrolyte and is used to “salt” streets in the winter to melt ice and snow. Write a reaction to show how this substance breaks apart when it dissolves in water. Commercial cold packs and hot packs are available for treating athletic injuries. Both types contain a pouch of water and a dry chemical. When the pack is struck, the pouch of water breaks, dissolving the chemical, and the solution becomes either hot or cold. Many hot packs use magnesium sulfate, and many cold packs use ammonium nitrate. Write reactions to show how these strong electrolytes break apart when they dissolve in water. Calculate the concentration of all ions present in the following solution of a strong electrolyte: 0.100 mole of Ca(NO3)2 in 100.0 mL of solution. Calculate the concentration of all ions present in the following solution of a strong electrolyte: 2.5 moles of Na2SO4 in 1.25 L of solution. Calculate the concentration of all ions present in the following solution of a strong electrolyte: 5.00 g of NH4Cl in 500.0 mL of solution. Calculate the concentration of all ions present in the following solution of a strong electrolyte: 1.00 g K3PO4 in 250.0 mL of solution. Calculate the concentration of all ions present in the following solution of a strong electrolyte: 0.0200 mole of sodium phosphate in 10.0 mL of solution. Calculate the concentration of all ions present in the following solution of a strong electrolyte: 0.300 mole of barium nitrate in 600.0 mL of solution. Calculate the concentration of all ions present in the following solution of a strong electrolyte: 1.00 g of potassium chloride in 0.500 L of solution. Calculate the concentration of all ions present in the following solution of a strong electrolyte: 132 g of ammonium sulfate in 1.50 L of solution. Which of the following solutions of strong electrolytes contains the largest number of ions: 100.0 mL of 0.100 M NaOH, 50.0 mL of 0.200 M BaCl2, or 75.0 mL of 0.150 M Na 3PO4? 4.34You may want to reference (Pages 131 - 137) Section 4.3 while completing this problem.State whether each of the following statements is true or false. Justify your answer in each case. (b) HF is a strong acid. 4.34You may want to reference (Pages 131 - 137) Section 4.3 while completing this problem.State whether each of the following statements is true or false. Justify your answer in each case. (c) Although sulfuric acid is a strong electrolyte, an aqueous solution of H2SO4 contains more HSO4- ions than SO42- ions. You may want to reference (Pages 122 - 125) Section 4.1 while completing this problem.Complete the sentences to explain why each statement is true or false. (a) When methanol, CH3OH, is dissolved in water, a conducting solution results. (b) When acetic acid, CH3COOH, dissolves in water, the solution is weakly conducting and acidic in nature. We have learned in this chapter that many ionic solids dissolve in water as strong electrolytes; that is, as separated ions in solution.Which statement is most correct about this process? (a) Water is a strong acid and therefore is good at dissolving ionic solids. (b) Water is good at solvating ions because the hydrogen and oxygen atoms in water molecules bear partial charges. (c) The hydrogen and oxygen bonds of water are easily broken by ionic solids. Show how NaBr “breaks up” into its component ions upon dissolving in water by drawing molecular-level pictures. Show how MgCl2 “breaks up” into its component ions upon dissolving in water by drawing molecular-level pictures. Show how Al(NO3)3 “breaks up” into its component ions upon dissolving in water by drawing molecular-level pictures. Show how (NH 4)2SO4 “breaks up” into its component ions upon dissolving in water by drawing molecular-level pictures. Show how NaOH “breaks up” into its component ions upon dissolving in water by drawing molecular-level pictures. Show how FeSO4 “breaks up” into its component ions upon dissolving in water by drawing molecular-level pictures. Show how KMnO 4 “breaks up” into its component ions upon dissolving in water by drawing molecular-level pictures. Show how HClO4 “breaks up” into its component ions upon dissolving in water by drawing molecular-level pictures. Show how NH4C2H3O2 (ammonium acetate) “breaks up” into its component ions upon dissolving in water by drawing molecular-level pictures. Match each name below with the following microscopic pictures of that compound in aqueous solution.a. barium nitrate c. potassium carbonateb. sodium chloride d. magnesium sulfateWhich picture best represents HNO3(aq)? Why aren’t any of the pictures a good representation of HC2H3O2(aq)? Suppose 50.0 mL of 0.250 M CoCl2 solution is added to 25.0 mL of 0.350 M NiCl2 solution. Calculate the concentration, in moles per liter, of each of the ions present after mixing. Assume that the volumes are additive. 4.14You may want to reference (Pages 122 - 125) Section 4.1 while completing this problem.Complete the sentences to explain why each statement is true or false. (a) When methanol, CH3OH, is dissolved in water, a conducting solution results. (b) When acetic acid, CH3COOH, dissolves in water, the solution is weakly conducting and acidic in nature. When the metallic element sodium combines with the nonmetallic element bromine, Br2(l), what is the chemical formula of the product?Is the product a solid, liquid, or gas at room temperature? A solution contains one or more of the following ions: Ag+, Ca2+, and Cu2+. When sodium chloride is added to the solution, no precipitate forms. When sodium sulfate is added to the solution, a white precipitate forms. The precipitate is filtered off and sodium carbonate is added to the remaining solution, producing a precipitate.Which ions were present in the original solution? Review the solubility rules. Give ionic compounds that are soluble. Give ionic compounds that are insoluble? When potassium chromate, K2CrO4, dissolves in water, what ions are produced?